On September 26 2009 World Wide Views on Global Warming (WWViews) gave citizens all over the world an opportunity to define and communicate their positions on issues central to the negotiations at the United Nations Climate Change Conference (COP15) in Copenhagen. The main objective was to give a broad sample of citizens from across the world the opportunity to influence the COP15 negotiations and thereby the future of global climate policy. The overarching purpose was to demonstrate that political decision-making processes on a global scale can benefit from the participation of ordinary people. 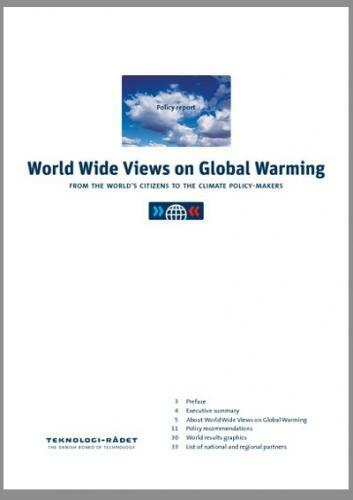 WWViews did send vital messages about climate policy from citizens to decision-makers. It created awareness about the importance of climate policy globally, nationally, locally, and individually. And it set a path-breaking precedent by demonstrating that ordinary people merit, and can have, a voice within global political processes. The UN's climate summit took place in Copenhagen December 7-18, 2009. Ministers from more than 170 countries participated, as well as 8.000 other participants consisting of government officials, representatives of NGO's,business and industry. The goal of the Danish hosts was to reach a binding global climate agreement that would apply to the period after 2012 when the Kyoto Protocol expires, which they unfortunately did not reach. In the negotiations, the position defended by each negotiator were decided at the highest level of national decision-making. As part of this process, political decision-makers were provided with pertinent scientific, technical and economic analysis, and the views of organized stakeholder groups (notably industry representatives and environmentalists). However, in order to decide what is in the public interest, decision-makers need to know the views of ordinary citizens as well, who are not active in stakeholder groups. The latter is what a deliberative process like WWViews was uniquely able to offer. In deliberative processes, citizens have the opportunity to learn what competing experts and stakeholder groups think, to test their ideas against people holding different views, and to reach a considered judgment that integrates all of this new information with their own values, worldview and life experience. Contrary to opinion polls, deliberative methods thus ensure informed and well-considered answers from the citizens, thereby providing more robust and trustworthy policy advice. The idea behind this project was to give citizens of as many countries as possible the highest degree of capability to reflect on a number of key questions of relevance to forthcoming climate policy. During one single day, September 26, 2009, WWViews partners hosted deliberations all around the globe. Within each participating nation roughly 100 ordinary citizens, chosen to represent their region's demographic diversity, gathered to engage in a structured dialogue aimed at answering an identical set of questions, and the results were gathered through a web interface. The questions reflected major controversies at the centre of negotiations at COP15. The introduction material presented to the citizens before and during the WWViews meetings (both written material and information videos) showed how these slightly abstract negotiations at COP15 and future COPs may affect people's lives in different ways with regards to changes in regional weather patterns as well as socio-economic consequences. These issues were addressed in WWViews in the form of predefined questions to vote for. In addition, citizens were asked to give, in their own words, their recommendations to their local community, their national politicians, and the COP15 negotiators (see questions and answers on the results sub-page). The national WWViews meetings were carried out almost simultaneously, meaning that from the first meeting concluded in the first time zone until it concluded in the last timezone, 24 hours had passed. On this day only, discussions about the questions given and the factual information relating to it, as well as all the voting and all the writing of recommendations, took place. The results were reported live to the WWViews website during this day. The national meetings were organised by National Partners, who met a set of criteria established in order to guarantee neutral and comparable results. The partners were all non-profit organisations, independent of political influence and most af them were experienced with regards to citizen participation; typically technology assessment institutions, NGO's, and university institutes. The primary focus was on policy makers around the world and negotiators at the COP15 meeting. It was an additional goal for the project to deliver results that would be accepted and referred to in the coming years by climate scientists, NGO's and political decision-makers. The COP15 host - DanishMinister of Climate, Mrs. Connie Hedegaard - supported WWViews as ambassador for the project and the WWViews results were conveyed directly to the delegates and publicized visually in the cityscape of Copenhagen. An international mediastrategy was prepared, targeting especially key media in selected countries, but national strategies were also made for creating media attention and presenting results to policy-makers in all partner countries. The realistic ambition was that several COP15 negotiators would be familiar with the main conclusions reached during the WWViews deliberations. The WWViews method is a hybrid based on several decades of innovation by the Danish Board of Technology (DBT - the Danish Parliament's Office of Technology Assessment), and by other WWViews Alliance members, in engaging citizens in political decision-making processes. Some of the methods have been implemented in trans-national projects in Europe, but WWViews was the first global project in this field. The core of the method was citizens meetings with 100 participants each, held in all participating countries. Citizens were selected with the aim of representing the demographic distribution in the region with regards to age, gender, occupation, and education. The method contained an element of authentic citizen expressions in terms of suggestions for action at individual, local, national, and international level. Part of the programme for the meeting contained thematic deliberations, which led to on-the-spot voting on a set of pre-prepared questions. The method had unique features connected mainly to global Internet based cooperation and Internet communication of the results. Using the Internet it was possible to include a practically unlimited number of meetings in the project. With a newly developed web tool for reporting results, the outcome of the meetings was reported to the WWViews web page immediately on September 26 after which the results were available there instantly. Comparisons of results between countries, regions, etc. were and still are possible on the results page. The citizens received information before and during the meetings based on the same principles of balanced expertise used in a variety of existing methods. The selection and phrasing of the questions to the citizens as well as the composition of the introductory material was tested at an early stage of their development incitizen focus groups in different parts of the world. An international Scientific Advisory Board with selected experts was appointed and consulted when the questions were selected and prepared for the introductory material. Information videos were made and shown on the citizen meetings and other efforts were made to prepare illiterate citizens for September 26. The Danish Board ofTechnology was responsible for the development of the method, development of the web tool, and for preparing the questions the citizens were asked, as well as the preparation of the introductory material. The Danish Board of Technology coordinated the project within the framework of the WWViews Alliance, established and coordinated by The Danish Board of Technology and The Danish Cultural Institute. For a description of the WWViews Alliance structure, please see the separate page "WWViews Alliance".